When five-year-old Lilliana Dennis was born in February 2011 in Indianapolis, doctors informed her mom and dad that she suffered from a rare genetic condition that was “incompatible with life.” As Lilliana approaches her sixth birthday, she continues to defy the odds and prove conventional medical wisdom both wrong and wrongheaded. Lilliana has Trisomy 18, also known as Edwards syndrome. As with Down syndrome, such babies are born with an extra chromosome, resulting in heart defects, respiratory problems, and finger and toe abnormalities. Most die before their first birthday, the doctors said, and there was little the Dennises could do to stop that eventual outcome. Fortunately, the Dennises did some of their own research, which contradicted what they had been told. In fact, one child graduated from college and lived to the age of 42. The Dennises also befriended Dr. Paul Byrne, a retired neonatologist, longtime pro-life activist, and founder of the Life Guardian Foundation (LifeGuardianFoundation.org). He recommended heart surgery for Lilliana, along with other life-saving measures, and although the road has been difficult, Lilliana’s prognosis continues to improve. To get a sense of how Dr. Byrne’s passion for saving lives all began, it’s helpful to go back to the very beginning, when he was a young doctor practicing at Cardinal Glennon Children’s Hospital in the mid- 1960s. 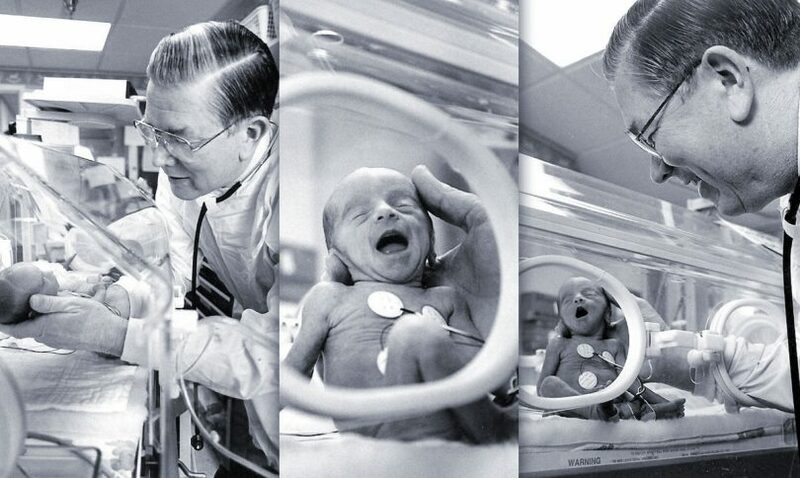 There, Dr. Byrne established the hospital’s very first special care nursery for at-risk infants. After that first year, Dr. Byrne’s efforts had saved the lives of 30 babies. “How?” you might ask. For starters, he partnered with engineers working nearby on the space pro-gram. They had developed a plastic cuff to fit around the fingers of astronauts, enabling their blood pressure to be monitored during space missions. Together, they developed a spinoff that fit around the arm of a tiny baby: Before this invention, there was no way to monitor a baby’s blood pressure. Dr. Byrne and his team also pioneered new techniques for feeding these babies intravenously as well as specially designed ventilators to augment their respiratory function. All were instrumental in helping such infants survive. Since preemies are so small, new, highly sensitive measurement protocols were also necessary to track their health. It was also heartening for him to witness babies who had been deemed hopeless develop into healthy children and adults. The birth of Joseph in 1975—at a mere 24 weeks’ gestation— was one such miracle. “He had a flat electroencephalogram or EEG—in other words, no brainwaves,” Dr. Byrne recalls. While considered breakthroughs in their day, many of these developments are now commonplace in both neonatal intensive care units and medical care as a whole. Plastic cuffs are routinely used to measure blood pressure of patients. During the early 1970s, Dr. Byrne witnessed a trend he found troubling: the increased acceptance of brainwave cessation as a legally acceptable marker of death. This occurred even before abortion became legally available in most states, and it owed in part to new ways to artificially resuscitate patients to keep a person’s heart beating with circulation and respiration. It also followed the world’s first heart transplant in 1967, after which organ transplants became common practice in a short amount of time. “The push to accept ‘brain death’ has a lot do with the concurrent push for viable organs for transplants,” says Dr. Byrne. He noted that, following that first heart transplant, the medical community began lobbying elected officials for new laws that first codified “brain death” in the US. This had practical reasons. Dr. Byrne points out that to transplant a heart or a liver, the donor’s heart, circulation and respiratory processes must be kept functioning for healthy vital organs to be removed. Organs from a cadaver are useless, he notes, because organs begin to decompose immediately after those functions cease. “Now, when someone suffers a head injury or is deeply unconscious, there is a shift of emphasis from helping that patient to harvesting his or her organs for transplantation,” he says. The fact that viable organs are very valuable to the organ transplant industry can add a monetary incentive to the push to declare patients legally dead. Forty-seven US states have passed the Uniform Anatomical Gift Act (UAGA) that presumes everyone is an organ donor. This is in addition to those who have willingly registered as organ donors on their drivers’ licenses. This often creates a conflict, when the same individuals have also filed advance DNR (do not resuscitate) directives. In such situations, that previous DNR order will be overruled and the patient will be resuscitated in order for their vital organs to be usable for transplantation. The Jacobs case was the subject of a CBS News report, and the elder Jacobses ultimately won a $1.2 million settlement in 2012. More recent is the case of the now-16-year-old Jahi McMath, who had severe sleep apnea and on which Dr. Byrne is a medical advisor. Jahi underwent a tonsillectomy at a California hospital, which aimed to improve her ability to sleep at night. She later hemorrhaged and went into cardiac arrest. Physicians declared her to be “brain dead” and ordered the removal of life-support systems. Jahi’s mom, Latasha Winkfield, disagreed and filed a lawsuit seeking to keep her on life support. A death certificate was issued for Jahi in California before she could be moved to a New Jersey hospital. She later was moved to an apartment with her mom, where she continues to live on life support. Incidentally, Dr. Byrne was instrumental in getting a new law passed in that state, which gives parents or caregivers the ability to object conscientiously to such orders from a physician or hospital. A similar regulation, though not as strong, now exists in neighboring New York. 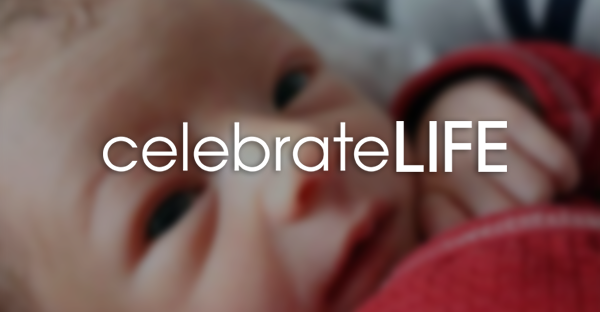 Dr. Byrne is a steadfast pro-life advocate and supporter of American Life League (ALL). His knowledge and guidance shaped ALL’s policy on euthanasia and brain death; he is the author of our materials on the subject. Most recently, he played an important role in the development of a study guide on euthanasia for ALL’s Culture of Life Studies Program. In addition to supporting ALL and other organizations, Dr. Byrne saw a need for another organization focusing attention on end-of-life issues. That led to the founding of the Life Guardian Foundation in 2007. The organization’s website offers a rich repository of resources that helps people understand the controversies that now surround the end of life. Besides the moral and ethical implications, there’s a lot of practical value as well. Many of us now must deal with the treatment of elderly parents, and the use of feeding tubes is often taken to mean that their lives are at the end. Not necessarily so, says Dr. Byrne. “People on a feeding tube don’t always have to remain on a feeding tube,” Dr. Byrne says. Noting that it’s not always easy, there are ways to treat such patients that can improve their outlook and lead to a time where a feeding tube can be removed. Similarly, severe head injury often leads to a grim prognosis— yet treating the patient with thyroid medications can greatly improve patient prognosis. Poke around a bit more on the website and you’ll uncover other fascinating information. There are more than 30 disparate sets of criteria. You can be declared “brain dead” by one but be alive by others. The Uniform Declaration of Death Act (UDDA) now on the books in all 50 states mandates that the determination be “in accordance with acceptable medical standards.” The patient who is declared “brain dead,” whichever criteria are used, always has a beating heart with circulation and respiration, albeit on a ventilator. The procedure of an apnea test (not a test for sleep apnea) is part of every set of “brain death” criteria. The patient is taken off the ventilator for 10 minutes. Carbon dioxide and acids accumulate. This makes the brain swelling worse. Everyone must learn to instruct No! to the apnea test. It can only cause the patient to get worse. “If you end up unconscious and on a ventilator, the doctors at the hospital treating you will declare that your death is imminent, and by law, they have to notify the Organ Procurement Organization (OPO),” says Dr. Byrne. If you don’t want that to happen, Dr. Byrne strongly urges you to explicitly document your refusal in writing. The foundation website offers three key directives that can help you accomplish that objective: a healthcare power of attorney directive, a directive to protect and preserve life for a dependent minor or mentally incapacitated person, and an organ donation opt-out form that can be carried in your wallet or purse. “Very often I work with parents of students who go away to college, get into a car accident, and end up at the mercies of a medical system that wants their organs for a transplant patient,” he notes. Since few people have taken the time to study the issue, and since parents are often bewildered and grief-stricken at such times, it can become a complex battle to receive any form of life-extending care for such patients. Upon being reached by phone for an hour-long interview, Dr. Byrne was quick to shift the emphasis away from himself and to his large family. He’s the father of 12 children. He also has 33 grandchildren and five great-grandchildren. He’s proud that he has reared a pro-life family. He’s especially proud of the pro-life poems that his son, Mark, wrote from his heart in the eighth grade—and as Providence would have it—his granddaughter Kaitlyn, Mark’s daughter, recently wrote from her heart in the eighth grade as well. Celebrate Life has happily agreed to publish each poem in its entirety! More critically, he pointed out the clarity by which young people often view the world around them, and the crystal-clear viewpoints they often form on issues that bedevil their elders, provides a lesson for the rest of us. Both pieces speak right to the heart, he says. where will I get put next? where is my search party? does free will make or break us? saving lives day by day. that helps me every day. the sunlit light blue sky. a touch of dew on its petal. I mostly think of a baby. A baby who is playing gaily with its toys. Rob Sample is a freelance writer from Monroe, Connecticut and father of two. He has worked in publishing and corporate communications for 30 years and has been published in a variety of business, scientific, religious, and educational publications.